Not much on the schedule last night, but plenty of news. 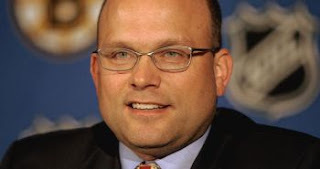 The Boston Bruins extended the contract of Peter Chiarelli yesterday. Great news for a franchise that seems to have finally figured it out. Numbers prove that Julie Lugo is, defensively, the Mo Vaughn of shortstops. The PawSox were "rained" out, so Clay Buchholz will pitch Game one of today's double-header. Our good friend Chad Finn has a new column up (which mentions us) and is concerned Casey Kelly could be the the new Frankie Rodriguez (the old Sox pitcher, not K-Rod). Paul Perillo has a nice article up about the competition between Kevin O'Connell and Matt Gutierrez. What is this obsession Danny Ainge has with the number 2 pick? The Sea Dogs are back home, and face Erie tonight at 7.